Newly-installed radios at Medstar Montgomery (MMMC) and Holy Cross Silver Spring (HCSS) are now on the air. So that makes three of six Montgomery County hospitals with fully functional ham radio installations. Both hospitals are set up with two TM-D710GA radios and triband antennas. One antenna is a Comet CX-333 (2m/1.25m/70cm), and the other is Comet GP-15 (6m/2m/70cm). That provides the possibility of using four bands if radios and diplexers are brought in for the additional bands. Having two dual-band radios allows one radio to be used simultaneously on 2m packet and a 70 cm regional hospital net, leaving the second radio available for communications within the county or within the facility, depending upon needs. Having two radios and antennas also provides a measure of redundancy. 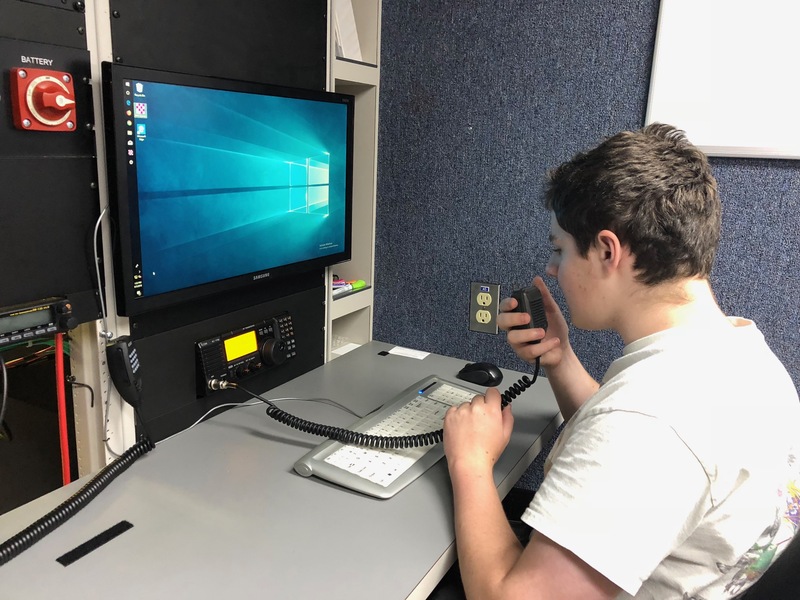 At both hospitals, the radios are installed in a classroom that is designated to be used for communications and logistics during large-scale emergencies. That allows us to communicate freely without disturbing meetings taking place in the nearby hospital EOC. 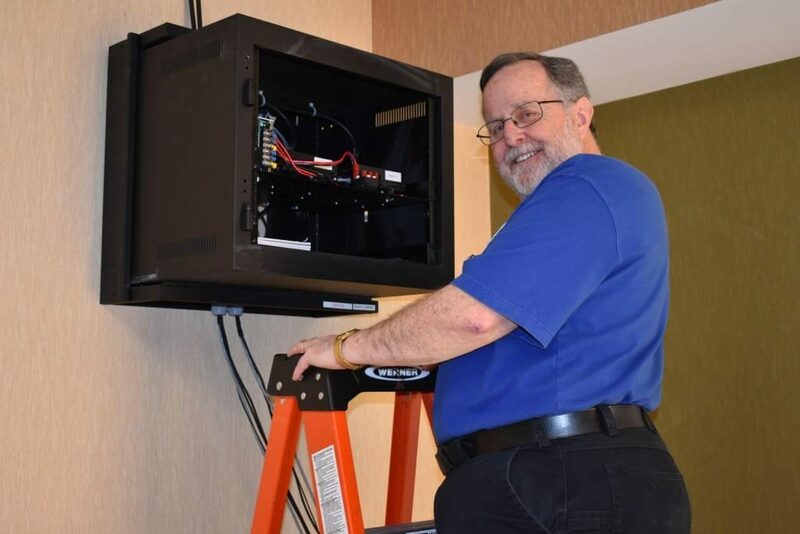 The installation at MMMC is similar to the one at Holy Cross Germantown, with the radios installed in a locked wall cabinet and cables leading to the radio control heads on a table. Powerpole connectors were used throughout for maximum flexibility. A mains power receptacle inside the rack (and other outlets in the room) are fed from the hospital’s emergency power system. Paul, N3RQV is shown here with the equipment. At HCSS, the facility folks did not want anything mounted permanently on the wall, so the radios and power supply are mounted in a Pelican case. The antennas are wired to N connectors mounted on the wall. 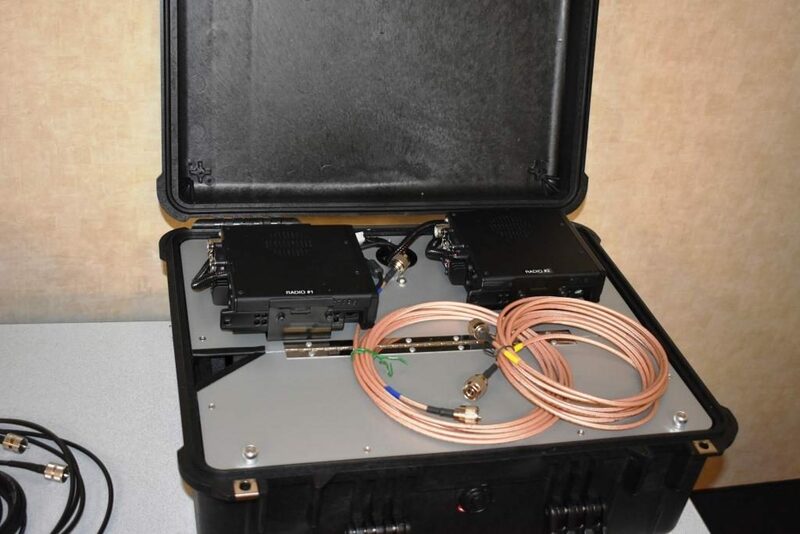 Setting up is a matter of placing the Pelican case on the floor under the operating position, connecting jumper cables from the radios to the wall-mounted antenna connectors, plugging in the control head and microphone or headset, and plugging in the attached power cord. We need to think about lighting for both stations in the event that the hospital is running on emergency power. Lighting is often an afterthought! In most hospitals, only a fraction of the lights remain on when the facility switches to the backup generator. We still have to get accessories, including computer headsets (such as the Yamaha CM-500, widely available for $60) and headset adapters for the radios. Our annual meeting was held on Sunday, February 10. The most important business at the meeting was the election of officers for the coming two-year term. Ben Acton, our past Vice President, reluctantly made the decision to step off the board. For years, he has been a part of the leadership team, often serving as our primary liaison with OEMHS. For a variety of reasons, he feels that he can no longer devote sufficient time to continue in office. We all owe Ben a debt of gratitude for his years of service. Tom Horne was elected Vice President, and Paul Fitzgerald was elected to the board as a member-at-large. The remaining board members were unopposed and all were reelected. Your board members are listed on the “Contact Us” page of the website. The rest of the meeting was devoted to a discussion about the future direction of the organization. A lot of thoughtful ideas were shared. MCACS participated in Winter Field Day on January 25-26, 2019. The event was an unqualified success, and a lot of fun as well. For more information about the event, check out our Winter Field Day web page. 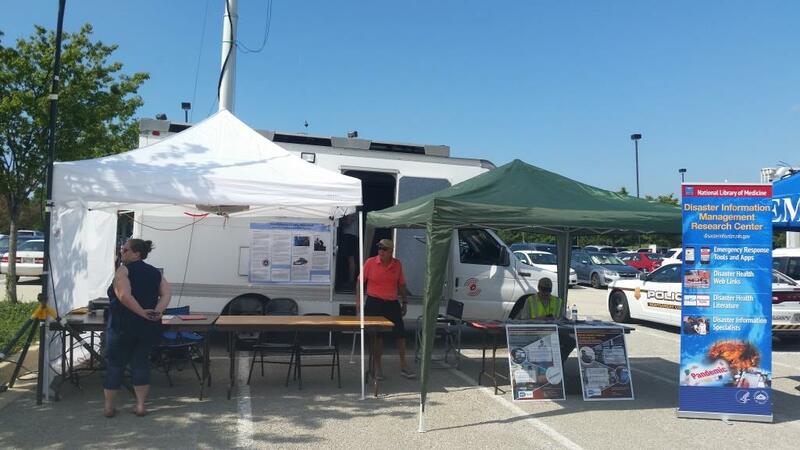 On September 5, MCACS joined forces with several Montgomery County Amateur Radio clubs, to demonstrate our readiness to provide supplemental communications in disasters. The occasion was the Fourth Annual Emergency Preparedness Fair jointly sponsored by the National Cancer Institute and Johns Hopkins University at Shady Grove. View of booth with MAIPN van in background. (L-R) KC3JFG, WN3R, and W3CID (doing double duty at the National Library of Medicine booth). Our booth featured a voice/data flyaway (go-kit) station. The new MAIPN communications van was on display as well. Representatives of the Montgomery Amateur Radio Club, NIH Radio Amateur Club, Ashton Radio Amateur Society, and Damascus Emergency Communications Team were on hand to speak to the public about the role of Amateur Radio in emergencies. The broiling weather, in the 90s with plenty of sun and high humidity, kept attendance down, but we saw old friends and made a few new ones. We also caught up with fellow exhibitors, including Montgomery County CERT, NIH Police, and the Red Cross. AC3CJ at the mic of the IC-718 in the van. Participants (in no particular order) included WN3R, W2LNX, W3TDH, W3EDS, NC3M, W3CID, and the entire Schofer family — KC3JFG, KC3FKH, and AC3CJ. Our event hosts were NCI staff members K3DXO and KC3DXM. WB2U was standing by at home to lend support. KB3AEV stopped by for a visit.